11. The Government received 512 responses during the 12 week consultation period. Representations were received from 25 campaign groups, from six MPs and two Peers, from a number of other interested stakeholders including the Metropolitan Police Service, the Greater London Authority,Westminster City Council and the Law Society of Scotland. However, most responses – over 90 percent – were received from members of the public. 12. 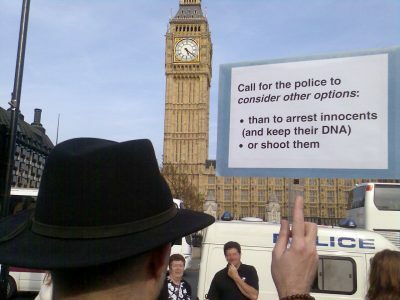 The vast majority of responses – over 95 percent – either explicitly or implicitly called for the straight repeal of sections 132 to 138 of the Serious Organised Crime and Police Act (SOCAP), rejecting arguments that a distinct framework for managing protest around Parliament could be justified on security grounds, or on grounds that the business of Parliament needed special protection, or by a need to safeguard wider public enjoyment of the space. 13. 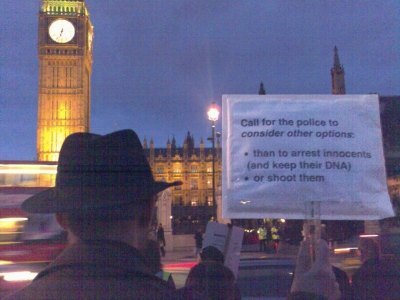 There was a clear and strongly articulated view that sections 132 to 138 of the Serious Organised Crime and Police Act, and in particular the requirement to notify the police in advance, have restricted and stifled spontaneous protest in the area around Parliament.There was also a clear view expressed by members of the public that the area around Parliament is special in that it is the focus of political protest and that nowhere is the right to protest and voice one’s views more important than at the seat of Parliament itself. (2) In the Table in section 175(3) of that Act (transitional provision relating to offences) omit the entries relating to section 136. (3) In paragraph 1(1) of Schedule 2 to the Noise and Statutory Nuisance Act 1993 (c.40) (which is about consents for the operation of loudspeakers) omit "or of section 137(1) of the Serious Organised Crime and Police Act 2005". This intention is welcomed, but at this stage this is just a draft bill which may be changed and will take time to come into force. If this happens then we'll return to the status quo before these sections came into force – minus all the arrests of peaceful protesters in the designated zone and the time wasted by protesters and the Police alike in dealing with the required authorisations. What do Marper, S., Kevin Reynolds and myself have in common? We're all innocents who have had our DNA taken following an arrest. I have been the lucky one as it only took me two years to get my DNA profile removed and samples destroyed. Marper & S. are fighting it all the way to the European Court of Human Rights (ECHR), and Kevin Reynolds has had to go through a traumatic arrest, which could have been avoided had the Police immediately checked his previously retained DNA profile. With Internet Explorer on Microsoft Windows: original version and English version. Ironically, the advertised links can only be watched with Microsoft software – when another EU department just levied a record €899 million fine against Microsoft for flouting its competition rulings. 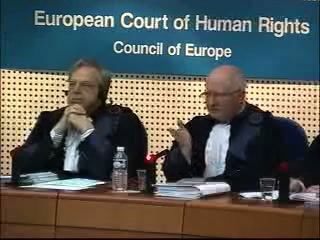 find some background on this case in the following two blog entries: Forensic use of bioinformation and human rights and National DNA Database breaches Articles 8 and 14 of the ECHR. Several mentions of memorials contributed by both sides were made during the hearing; I've tried to figure out if they're publicly available but so far without success. learn about what happens when the Police eventually agree to delete/destroy someone DNA profile/sample, read my Register article: How to delete your DNA profile. The process map promised by the Specialist Crime Directorate (SCD12) for early 2008 has not yet been published. Collecting more DNA from crime scenes has made a big difference to the number of crimes solved, but keeping DNA from more and more people who have been arrested – many of whom are innocent – has not. Since April 2003, about 1.5 million extra people have been added to the Database, but the chances of detecting a crime using DNA has remained constant, at about 0.36%. What about the risk for innocents of being on the NDNAD? The policeman who led the hunt for Sally Anne Bowman's killer today called for a national DNA register. Detective Superintendent Stuart Cundy said having everyone's DNA on file would speed up arrests and cut down on further offending. What Detective Superintendent Cundy didn't mention is how, in this very same case, the data retained on the National DNA Database was ignored to arrest an innocent for murder, indecent assault and robbery. Let's go into more details of the case of Kevin Reynolds to understand how retaining DNA samples and profiles of innocents does not automatically help to eliminate them as suspect in investigation. Postman Kevin Reynolds had had his DNA and fingerprints taken on 2002-06-14 when he was charged, but later acquitted, with being drunk and disorderly. The profile was loaded on the NDNAD on 2002-07-04. Even though he was acquitted, his fingerprints and DNA profile remained on file. 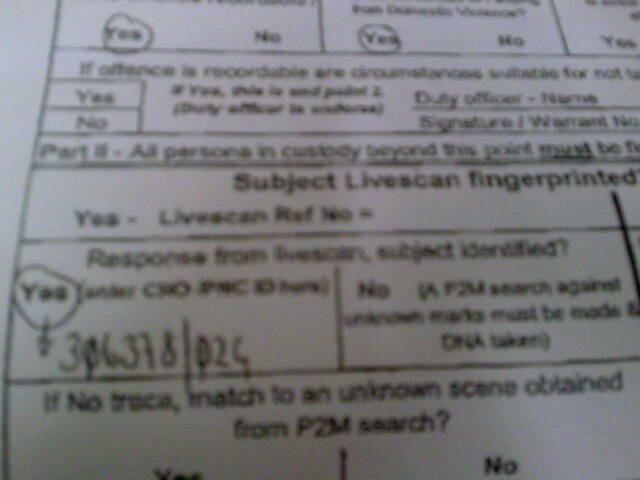 An SRE is returned to the Livescan unit. This will be received after the ACK and once the search has been completed (and verified if requested). This will contain the result of the search. If a search is verified, i.e. has been viewed by a fingerprint expert, there will be one CRO. If the search is non-verified, there may be up to four respondents displayed, with system confidence ratings (High, Medium, or Low). If the result is a no trace, No Respondents will be displayed. 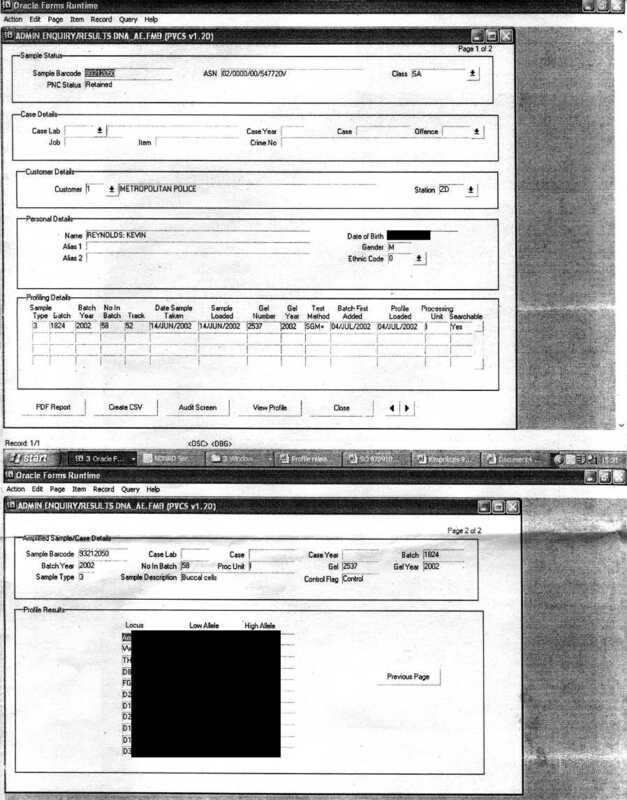 The sample which you supplied to the Metropolitan Police Service on 12 December 2005, in connection with a murder inquiry, was analysed by the FSS in order to generate your DNA profile. Your DNA profile was compared against the DNA profile obtained from the crime scene. Additionally your DNA profile record relating to this sample was submitted to The National DNA Database and is now retained, in compliance with legislation, on The National DNA Database. A news article from the Metropolitan Police Service explains: ‘ At an early stage DNA was recovered from the murder scene, which police believed identified the murderer. ’ The Police had profiled the DNA from the crime scene, they had a man in their custody for whom they already had a DNA profile loaded in the system, the identification of this man was even confirmed by Livescan, and they still arrested him for the murder of Sally Anne Bowman? Kevin's DNA profile on the NDNAD would have been sufficient to show there was no match and clear him from suspicion. It doesn't stop there. At 14:15, Kevin is further arrested for indecent assault and for the robbery in Sanderstead Road (this attack is linked to the murder of Sally Anne Bowman). He reiterates: ‘ I am completely innocent ’. At 21:18, Kevin is taken to a double identity parade using video capture; he learns two hours later from his solicitor that both id parades were negative and in one of them another person was picked out. At 12:09 the next day, Kevin is formally interviewed, and close to half an hour in the interview, the interviewing officer's phone beeps to tell him that Kevin's DNA didn't match the crime scene's DNA, and he's eventually released as no further action (NFA'd). "They pulled my house apart - breaking furniture and damaging the walls - and went through all my files. Yet, I was not asked a single question about my son," he says. Kevin's DNA eventually cleared him after more than 34 hours and a harrowing experience. Having his DNA retained should have cleared Kevin immediately, but it did not. They did not use the retained DNA samples and profile. DNA appears to be used only when convenient for the Police, with little respect for innocent individuals. The detective who led the Bowman investigation said: “It is my opinion that a national DNA register could have identified Sally Anne’s murderer within 24 hours.” The innocent would have nothing to fear, while the guilty would be caught. It could even deter criminals. Thanks to Stephen Cragg for the title of this post and to Kevin Reynolds for his assistance regarding his story. First published on 2008-03-16; last updated on 2011-01-01. Yet another Counter-Terrorism Bill is currently before Parliament. It will impose new and worse forms of punishment without trial. Since the first permanent Terrorism Act of 2000, people have suffered much injustice under anti-terrorism measures, particularly Muslims and migrant communities. Out of over 1,200 people arrested under anti-terrorism laws, less than 5% have been convicted of ‘terrorism’ offences, few of these involving any plans for violent activities. Less than 20% were even charged with such offences. A key effect and political aim has been a climate of fear – fear that political activity, or simply talking to the wrong people, will bring arrest or house raids. Why does the government propose yet another Counter-Terrorism law? What effects will it have? What can people do to oppose it? This Friday 2008-03-14, 6.30pm-9.00pm at the London Muslim Centre, 46 Whitechapel Road, London E1 1JQ, speakers will look at unjust effects of the current anti-terrorism measures and how this injustice would be extended by the new proposals. They will explain and analyse the proposals in the new Bill. There will be plenty of time for questions and discussion – about what powers to oppose, how to present the issues to your own community, and what action to request from your MP. Event organised by the Campaign against criminalising communities (CAMPACC) with the Centre for the study of terrorism (CFSOT), and co-sponsored by the London Muslim Centre, Islamic Forum of Europe, Cage Prisoners and the Newham Monitoring Project. The government’s new proposals are based on the Terrorism Act 2000, which defined terrorism so broadly as to include simply the threat of violence to property in an attempt to influence a government, anywhere in the world. This broad definition, with offences like belonging to or helping a banned organisation, criminalises many normal political activities in the UK and any resistance to oppressive regimes abroad. ‘Terrorism suspects’ could be detained without charge for six weeks. Before 2000 it was 4 days. Neither government nor police have given any convincing reason for such a long period. The USA manages with 2 days, Algeria in 12. Post-charge questioning of ‘terror suspects’ – presumed guilty? ‘Terror suspects’ could be subjected to further questioning after a criminal charge, even up to the trial date. Saying nothing could count against them at trial. At present, once charged one can refuse to answer till their trial, without this being interpreted as a sign of guilt or deception. Judges could give people longer sentences for ‘ordinary’ offences if they had a ‘terrorism connection’. For example, public order offences like organising an unauthorised demonstration, if a speaker allegedly supports a banned ‘terrorist’ organisation. 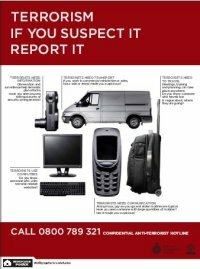 Convicted ‘terrorists’ could have their property confiscated – such as bank accounts, vehicles, computers or even a house. The special procedure for doing this would not be a normal trial. It could involve secret evidence which the affected person would not be allowed to know. Any connections between the property and terrorism would only need to be shown ‘on the balance of probability’. Charities’ funds could be confiscated in the same way. Convicted ‘terrorists’ could face a ban on foreign travel once released from jail. This would be done by a special order, not a trial. Those convicted could also face a requirement to tell the police where they go whenever they sleep away from home, in some cases for life. 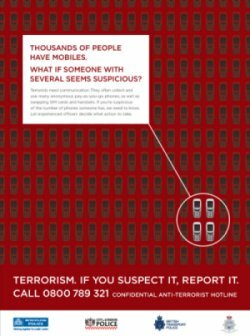 It is already an offence under the 2001 terrorism law not to tell police of suspected terrorist activities if you find anything suspicious in the course of your employment. The 2008 Bill extends this to volunteer workers, for example in a youth project or charity. 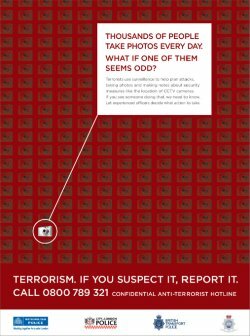 People might be over-suspicious and report imagined activities because they are afraid of being criminalised for concealment. They also might be deterred from volunteering in a charity that sends money to Afghanistan or Palestine, for example. The Bill would make it an offence to seek or communicate information about the armed forces which could be useful to terrorism. This could apply simply to peace protestors telling each other, for example, what happens at which gates of a military base. The Bill would allow for the government to hold some inquests in secret, without juries, if evidence would be heard which they believe should not be made public in the interest of national security, international relations or any other public interest. Sensitive material about how and why a person was killed by the police or army would be hidden away and they would never be held properly to account. 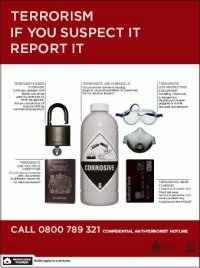 For more information on the bill and a model letter to send your MP visit the CAMPACC Briefing Document Counter Terrorism Bill 2008. Please ask your MP to oppose these proposals! Information in this post is from the announcement for this event. For the past two years or so I've been wearing a badge designed by Vivienne Westwood for the civil liberty organisation Liberty. On it is written in friendly letters ‘I am not a terrorist, please don't arrest me’. Liberty describes the writing as ‘a child-like scrawl plea’. It obviously works as I have not been arrested, or even stopped and searched, since I started wearing this badge. The badge helps people realise that we must all adopt a rational attitude to the terrorist threats. We must promote measures that really do enhance our security and not security theatre measures that just inconvenience many innocents and do not make us any safer. I have travelled abroad many times while wearing it. While waiting in security queues at airports I had the occasional positive response from fellow passengers. At Stansted Airport, early February, I had the first and so far only negative reaction to it. While I was waiting at the gate, by the counter, for an Easyjet flight to Copenhagen, a Swissport staff requested that I remove the badge which was pinned to my coat. When I queried the staff why he was making such a request, he explained his motivation was that it might upset some passengers. I pointed out that the design of this badge is friendly and the message is non-threatening. I found his request upsetting and that his motivation was purely hypothetical as he hadn't heard from any concerned passenger. As he insisted, I complied with his request. This exchange was short and polite. At the bottom of the steps leading to the tarmac, he further discussed this incident with a colleague travelling with me adding that you have to be careful because some people are getting nervous about these things. On board of the plane, my colleague opened The Times, and the headline on top of p.3, visible from several rows, was ‘Ryanair ordered to pay damages to steel band ‘terrorists’ thrown off jet’. Oh, the irony. As all communications from passengers and customers are important to us, we do investigate all complaints or comments fully, and by the nature of our business this can take longer than perhaps I might prefer. I have now had the opportunity to investigate the circumstances surrounding a member of Swissport staff asking you to remove your badge before boarding a flight at Stansted Airport. Our business as a major provider of airport ground handling services around the world, works hard with our customer airlines and operators at airports where we work, to ensure aviation continues to be a safe and secure method of transport. The aviation industry is rightly well regulated and all businesses co-operate with the Department for Transport and the police services and security staff at the airports to meet these regulations. Additionally, we try and ensure that passengers are spared additional anxiety that they may feel as a result of enhanced security processes at the airports. 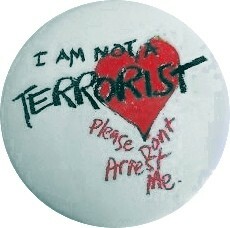 The badge which I understand you were wearing bears the message "I am not a terrorist. Please don't arrest me." Whilst it is unlikely that anybody could take exception to such a friendly and, presumably well-intentioned sentiment, our concerns were that the word "terrorist" was clearly the most prominent and could be read from a distance, while the context in which it was used could not. Our request for the badge to be removed while you were preparing to board the flight and during the flight itself, followed consultation with the airline on which you were travelling, in particular the Captain and senior cabin crew member. We did not intend to cause you offence or to demonstrate support or rejection of the objectives of Liberty, the cause which I gather the badge supports. It was merely to spare other passengers any potential anxiety through the prominence of the word "terrorist" in what many would consider a security sensitive area. As part of legislative requirements, all airport staff are now required to undergo a greater degree of security awareness training and one of the supporting strains of this is to recognize and to act upon the “out of the ordinary”. I hope that this provides some explanation of the reason for the action of our member of staff and I trust that this explains why you were asked to remove the badge on this occasion. It is reassuring that airport staff benefit from additional security awareness training. This is exactly the type of measure that increases our safety. Unfortunately some of the explanations still left me confused. Neither my colleague nor I noticed the Swissport staff having radio communications with the Easyjet Captain. We may have missed that as even though we were right by the counter we weren't paying particular attention to this. However, during the request to remove my badge, there was no mention of any consultation with the Captain. Sparing potential anxiety is of course something I fully subscribe to, but how come the word ‘terrorists’ when more prominent on a newspaper has not the same potential to create anxiety in a security sensitive area? Security measures, if efficient, should be applied consistently. Why singling my badge out? Thank you for your further correspondence, and my apologies for a tardy reply. I have been dealing with a large redundancy issue which as I hope you can appreciate is very time consuming. Our dispatchers are responsible for ensuring the boarding process is safe and timely and, as such, liaise with a number of personnel during the time the aircraft is on the ground. It is likely you would not have been aware of all of these discussions, some of which will have been made by radio or telephone from our Operations office, and there was no need for the dispatcher to explain them to you at the time. Whilst I can understand your frustration, I am satisfied that in the light of the circumstances on the day as they were explained to me, the dispatcher made the right decision in asking you to remove the badge in question. The dispatcher was the senior member of our staff on duty at the time and, as such, I support his decision and am grateful to you for complying with it.